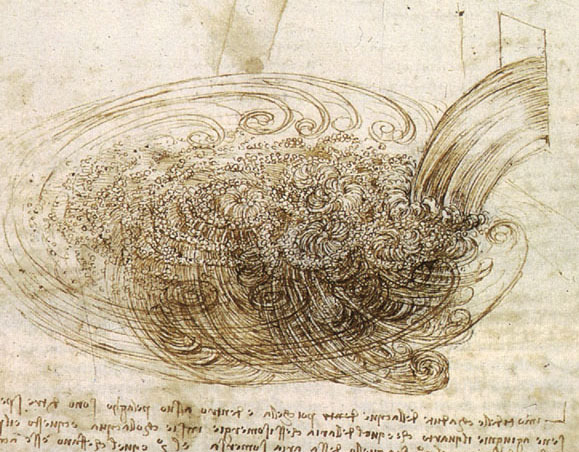 I have been looking at some of the drawings of Leonardo da Vinci to help understand how water moves. 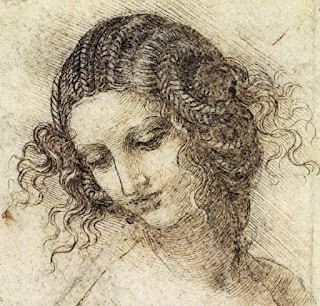 I love the drawing in the Royal Library, Windsor Castle, England. 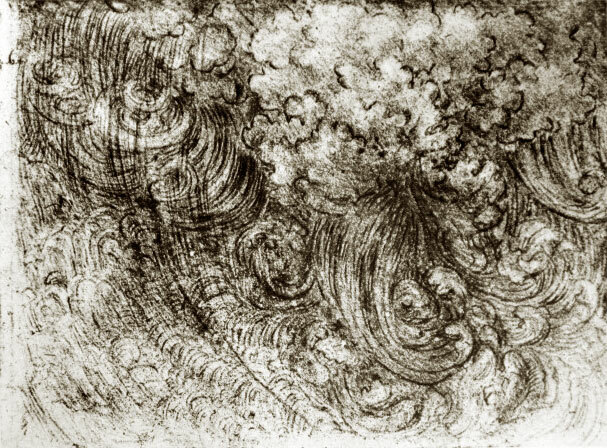 The movement of the water is slowed down as we see the beautiful patterns that the swirling wind and water make as they fall on the landscape below. 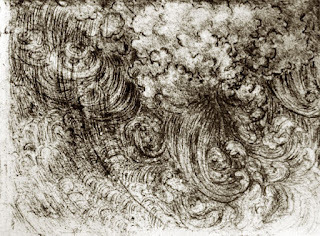 The coils of rain look like hair that has been carefully rendered with the black chalk on paper. 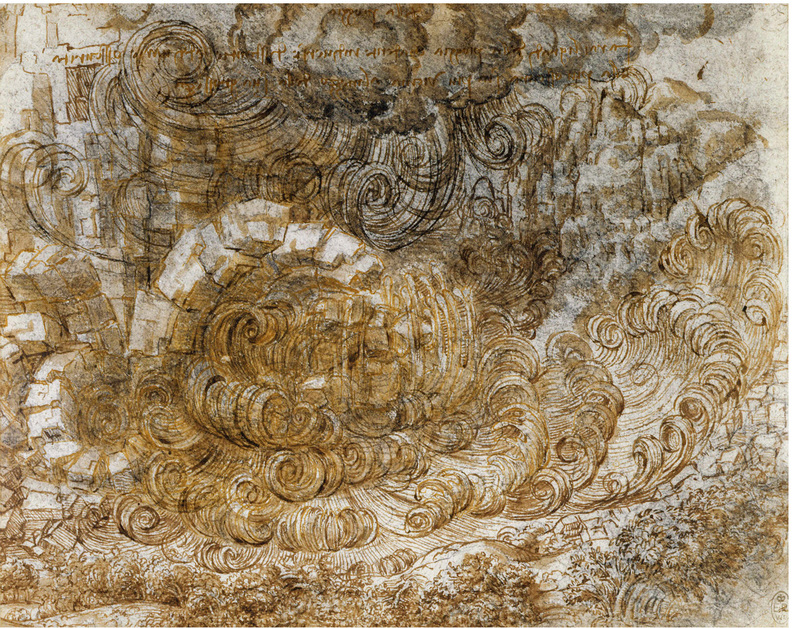 They do resemble the Chinese paintings that tend to go beyond the physical realm, yet de Vinci is very much looking at Nature and studying closely. 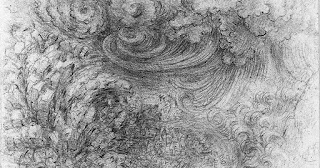 Like Abrecht Altdorfer, he was responding emotionally to nature. 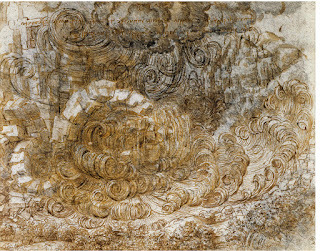 These pure landscape paintings with no figures at all make the landscape the sole subject of the painting. These studies turn the water into a sort of mathematical study, the geometry of the fluid water as it hits up against rocks and itself, falling and folding to make waves and curls again and again. The effect is mesmerizing and puts us in somewhat of a trance like when we watch the ocean waves come in and hit the shore. Each one a little bit different than the one that preceded it. 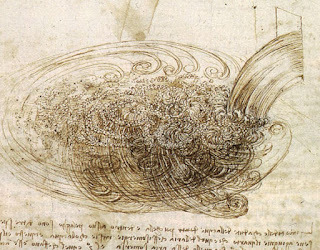 The drawing below of water pouring into a pool is also mesmerizing to look at. The way the clear stream all of the sudden turns into a magical swirl of shapes is so playful yet close to the heart of what we experience when water moves. 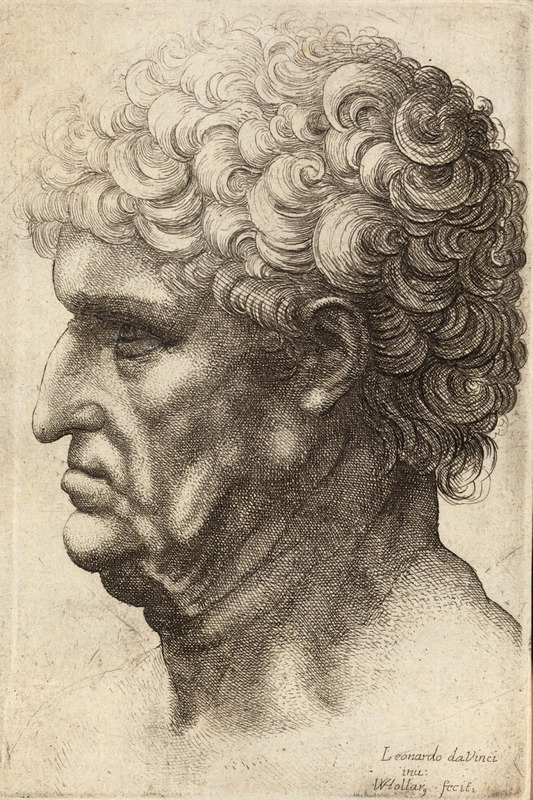 Photography hardly describes the phoneme as well as paint does, or for that matter drawing. You can feel and see the water bubbling up as the source from above comedown on it. The concentric circles get further apart as the water moves away from the source. Leonardo took it upon himself to reveal natures mysteries yet still keep them as mysteries. I feel after looking at one of his paintings or drawings that I understand what I saw better, yet I am so blown away that I am still no closer to understanding how it all works. My curiosity is fueled to love what I see more. The inner workings of the body, the endless questioning pulls me toward as source. How does it work? Where does it come from? Why so beautiful? Why so ordered?